What does Fashion Week, wireless charging technology and renowned physicist Stephen Hawking have in common? Surprisingly, Intel. 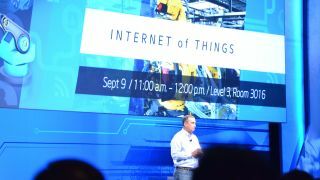 Intel CEO Brian Krzanich used his hour on stage at the IDF 2014 opening keybnote to tell a packed crowd about how the Internet of Things is growing and that Intel - with its newly branded Core M architecture - will be at the center of it. Krzanich made sure the usual suspects made their appearance - the DIY Arduino board, Edison; a compelling argument for "connected cities" using Intel's deployable City Sense Monitors; and how data centers are processing the over 1 trillion transactions that come from our mobile devices on a daily basis. What we didn't see coming was a heartfelt speech from Stephen Hawking that told us how the physically disabled were benefiting from Intel technology and how you might be getting Intel "Real Sense" camera technology in your next tablet. I have a smartphone. You have a smartphone. Heck, my parents have smartphones. In this world of interconnectedness, we need hundreds of thousands of data centers to make sure we can check our Facebook wherever we may be. Krzanich said this Internet of Things or IoT has grown year on year 20% and will exponentially increase until there are about 50 billion of these devices, seven per person in the entire world, by the year 2020. Where does Intel fit into this? Krzanich believes there needs to be both consumer and industrial standards for all this ... well, stuff. That's why Intel is leading the charge on establishing an Open Interconnect Consortium and Industrial Internet Consortium as a way to create standards throughout the industry. How exactly this will come together and, more importantly, how it will impact each and every one of our handheld devices remains to be seen. But, if we put any stock in a stray McAfee logo that popped up over and over again throughout the presentation, it's a safe bet "safety" is going to be one the committees' primary concerns. It wouldn't be an Intel event if we didn't hear about the latest line of i3, i5 and i7 processors and, thankfully, Krzanich didn't disappoint. We learned about the new 8 core, 16 thread Haswell-E line of processors a few weeks back that's intended to tide us over until Broadwell chips go into production (which, coincidentally, is sooner than you might think) but it was the announcement that Broadwell has gone into full production that really had us on our feet. It was Intel Senior Vice President Kirk Skaugen that got to break the news about the Broadwell chips, while whetting our appetites for the new line of Intel Core M mobile processors that Intel claims can run circles around the latest Qualcomm Snapdragon 805 chips. Finally, Skaugen gave the audience more information about Intel's new 14nm architecture called Skylake that hopes to cut cables - both power and data - when it drops in 2015. This announcement was supplemented with a rather interesting wireless charging demo that showed a laptop charging through 2-inches of material. Last on Intel's IDF 2014 docket was Real Sense - a new camera technology that can map out an object and give its close-to-perfect dimensions without the use of a measuring device. While this sort of advancement may not mean much to the average consumer, it has potential to make lives on the construction site exponentially easier. We will update this story and give you a first look at these products as we learn more here at IDF 2014.